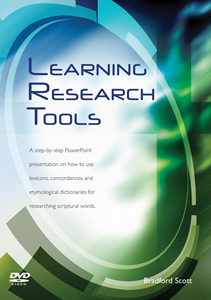 Brad methodically steps you through the use of lexicons and concordances for researching the meanings of scriptural words. Using PowerPoint slides, Brad shows how to trace New Testament words back to their Hebrew roots, and conversely, how to locate Hebrew words in the New Testament. By the end of this presentation you will know how to not only find the ancient Semitic meanings of words but you will also know how to break them down to their roots to help give concrete clarity to passages in Scripture. This teaching is also available on DVD.